At last we know why the mannequins keep losing their arms. For years I have told students about the diapered kangaroo hanging out in local nursing homes. Finally, after all these years I had a kangaroo encounter. 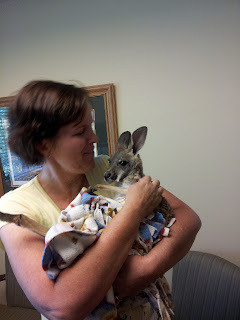 I was at the Bountiful Avalon care center and their administrator Noralyn Snow is the "kangaroo lady." This is Maddie, the 12th kangaroo she has raised. When they become naughty teenage kanagaroos they go back to the farm where she was born. In a verse from "It's a small world after all", Sarah the daughter of the kangaroo farmer completed our class a few months ago and told us a new kangaroo had been born. Who knew I would meet that kangaroo. They are very cuddly and sweet. She was licking my face and giving me kisses. I still standby my thought that if I went to visit someone in a nursing home and they told me there was a kangaroo wearing a diaper in their room I would want to know what drugs they were being given. 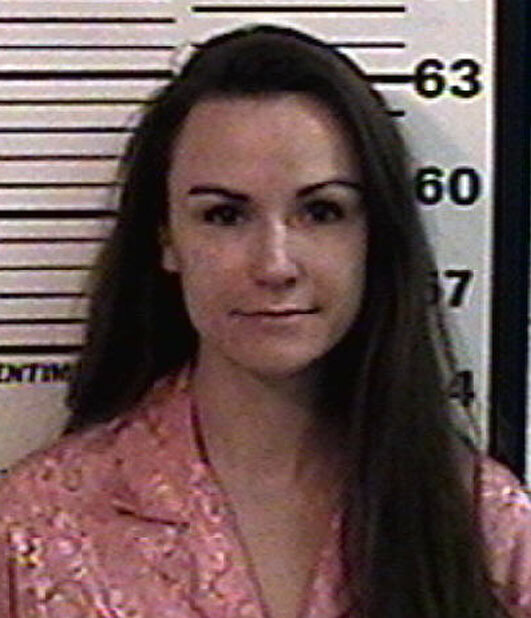 SUMMIT COUNTY — Summit County authorities have arrested a nanny they say physically abused infant twins — and it's not the first time the woman has been suspected of such a crime. Aubrey Anderson, a 31-year-old former nurses' assistant, lives in Salt Lake City but has also worked as a nanny in Belgium. She's also wanted there for child abuse, but that information didn't come to light until police started investigating her in connection with the Summit County case. "You hear about injuries children sustain that can lead to death, but fortunately it was caught in time with these children," said Detective Sgt. Ronald Bridge, with the Summit County Sheriff's Office. She was advertising herself as a child care infant expert. She was also advertising herself as a (registered nurse's) assistant. Authorities say Anderson presented herself as a reputable nanny. She posted ads on several nanny websites, with a resume noting she had provided child care in Europe. Anderson had also worked at Primary Children's Medical Center for the past 12 years, most recently as a part-time critical care technician. She resigned in April. "She was advertising herself as a child care infant expert," Bridge said. "She was also advertising herself as a (registered nurses') assistant." But Anderson became the focus of a criminal investigation in January, when infant twins in her care received suspicious injuries. Court documents say on Jan. 17, the parents noticed a bruise on their newborn daughter's face. Anderson told them the baby had rolled in her crib and smacked her face on the slats. Later that month, the parents took the girl's twin brother to the hospital, where doctors found he had two broken ankles and rib fractures, consistent with child abuse. "Having to take their children to a hospital to find out that they had been abused, that's a heartbreaking investigation," Bridge said. The investigation revealed a pattern of abuse. The case led authorities in Summit County to Belgium, where Anderson had also worked as a nanny. She's the suspect in a similar child abuse case there involving newborn twins. Anderson fled Belgium last year, and there's still an Interpol warrant for her arrest. "It's terrifying, truly terrifying," Bridge said. "Hopefully, now people understand a thorough background investigation is pertinent (when hiring a nanny)." Nannies are not regulated by the state, so it's important to check references and do your own online search. Prosecutors charged Anderson with felony child abuse. They asked the judge to set a higher than normal bail because they say Anderson is a flight risk. Meanwhile, Summit County authorities say Interpol does not plan to extradite Anderson and the case in Belgium is on hold until the one this one is resolved. Each local health department in Utah hosts a Medical Reserve Corps program. If you are interested, please visit http://www.utahmrc.org to find the unit in your area. Or, for more information, contact your local health department. Thank you for your interest and have a great conference! Nursing & Pediatric Oral CareBy educating parents and kids on oral health, nurses can help spare children from surgical tooth extractions in the OR. Poor oral health is occurring amongst young children at an alarming rate. Rumor has it that the Tooth Fairy pays less for teeth with cavities. If this rumor is true, then the infamous winged collector of primary teeth has been saving a lot of money lately. "There are tremendous impacts that result from childhood tooth decay," said Donna Hallas, PhD, PNP-BC, CPNP, PMHS, FAANP, clinical associate professor at New York University's College of Nursing. "Children with decayed teeth do not want to talk, and they tend to be less social hoping that others will not see the decay," she said. "On a more basic level, serious tooth decay poses problems for chewing food properly." Pediatric cavities, like adult cavities, require professional dental intervention such as fillings and crowns. If the decay is too extensive a tooth extraction may need to be performed. "There are a significant number of children in area hospitals on an OR waiting list to have teeth pulled," Hallas said. "These lists can be filled for months with children awaiting dental sedation to have extractions performed." "About 7 years ago NYU developed a formal partnership between our College of Nursing and our College of Dentistry," Hallas noted. "This partnership has grown and developed considerably since its inception." "Our goal was to explore how nurses and nurse practitioners could improve oral health outcomes in children under 5 years old," Hallas said. "We began by simply having our pediatric nurse practitioner students accompany our dental students as they examined teeth in dental clinics." discover opportunities for co-practice by dentists, nurses and nurse practitioners. "The partnership that we have with the College of Dentistry is very unique," Hallas noted. University administrators "are looking to carry this idea to the national level by helping to implement oral health curriculum in other nursing schools." she added. In one of the research studies on pediatric oral health at NYU, Hallas had nurses teach a group of about 100 new mothers some simple oral healthcare techniques for infants. "When education is done early, new mothers are eager to learn how to care for their children," she said, adding the new parents in the study quickly put into practice what the NYU nurses taught them. "The results were very encouraging. Of the mothers who came back for follow-up examinations, no cavities were present," Hallas noted. "Even if we had only a 10 percent improvement, it would be worth the 8-minute DVD that we used to explain oral healthcare to new mothers. Many new parents do not know some of the most basic pediatric oral health techniques, however, although nurses can help change that. "For instance, new mothers need to know about the vertical transmission of cavity causing organisms," Hallas said. "These organisms are transferred from mother to baby by simple things like a mother wiping off a pacifier with saliva or testing the spoon before giving it to the child. These seemingly harmless activities can be promoting cavities," she explained. Another aspect of proper pediatric oral health is ensuring children's teeth are adequately brushed. "Many parents do not realize that they have to brush their children's teeth until age 7 due to dexterity issues," Hallas noted. "Just because children are putting the brush in their mouth, it does not mean they are doing an adequate job. Parents should let the child brush his or her teeth first, but an adult should be the one to finish the job." Nurses should also educate parents on the impact of a poor diet or dietary changes on their child's oral health. "There is a strong correlation between poor oral health and a poor diet," Hallas said. For example, "foods that are high in sugar tend to stick to the teeth more than other foods." Many people wrongly operate with the assumption that their oral health has nothing to do with their overall health. Through early intervention, nurses can do much to correct this misnomer. "As a child moves into adulthood, he or she will continue the poor oral habits developed in childhood. Beginning good oral care habits early on makes the difference when permanent teeth come into place," said Hallas. "Oral health is part of a routine assessment of care," she concluded. "When you do assessment of a child, you have to take time to do an oral health check and teach parent and child what they need to know." Interprofessional collaboration is gaining a great deal of popularity within the healthcare profession. For example, although nurses and dentists have not had a long history of collaboration, NYU's College of Nursing is doing something to positively change the status quo. Scientists also sequenced the cell-free component of the mother's blood - called the plasma - where about 10% of the DNA circulating is from the child, and the other 90% is from the mother. That introduces some difficulty, since it's hard to tell exactly what comes from the child. Currently at least some component of diagnosis for genetic disorders in certain circumstances is done using technologies such as amniocentesis, which involves taking a sample of the fluid in the sac that surrounds the fetus in the womb – the mother has to have a needle inserted into her uterus, which is a lot more complicated than a simple blood test and carries some health risks. "This might reduce the need to do invasive testing for fetuses," said Jay Shendure, associate professor of genome sciences at the University of Washington. The focus of the study was the genome of a fetus whose mother's blood sample was taken at 18 weeks. The analysis of her blood, the father's saliva and the plasma contributed to a nearly full picture of the fetus's genome. This model showed that the fetus had 39 mutations that it had not inherited from either parent. To confirm, researchers looked at the baby's umbilical cord blood after it was born. In comparing the constructed DNA (from mom & dad's samples) and this cord sample, researchers found five additional mutations that hadn't come from the mother or the father. On the whole, the baby's artificially constructed genome using material from the parents was more than 98% accurate. Researchers repeated the procedure on a different couple. This time the mother was only eight weeks pregnant when she donated her sample, and the father submitted a blood sample, which was processed in the same way that the other father's saliva was. This resulted in a fetal genome sequence that was 92% accurate. "We could have brought it higher just by sequencing her plasma more deeply," said Jacob Kitzman, lead study author and graduate research fellow at the University of Washington. There are also parts of the genome that technology available today just cannot measure very well, Kitzman says, so that's partly why there's not a 100% accuracy here. Eight weeks are, however, well before mothers are able to get amniocentesis, which is often used at around 16 weeks. It took more than a month to get the results from the sequencing, which is a lot longer than would be ideal in a clinical situation, Kitzman noted. In order to become more widespread, the technique would have to be easier to administer, quicker and less expensive. So how much does this cost? Right now, in the ballpark of $50,000, Shendure says - and while that seems like a lot, keep in mind that this whole process involved sequencing the genomes of the mother and the father, separately analyzing the plasma and then double-checking the result with a sequence from the child's umbilical cord. The price tag for sequencing has dropped by 10,000 fold in the last five years, Shendure says, so he expects this fetal genome technique will also become less expensive over time. In the long-term, the technique may even help garner new insights about genetic diseases, but more immediately it would be restricted to identifying the genetic disorders that we already understand, he said. "Whether this is the sort of thing we would do on a widespread basis for all pregnancies, that’s an open question and a complex one," he said. The complexity comes, of course, from the ethical issues that arise concerning parents who would selectively abort fetuses that are predestined for certain conditions. The technology worries medical ethicist Harriet Washington, who fears parents could use genome sequencing to predict and selectively abort children that don't meet certain standards - not just for diseases, but for things like hair and eye color. “If we don’t look at the dangers, if we adopt this Pollyanna attitude and only look at the benefits, then it’s really easy to end up in a situation where we are blindsided,” Washington said. Perhaps one day, even intelligence scores or skills could be forecasted, creating a situation akin the movie "Gattaca" where babies are basically custom-created to suit the needs of parents who can afford the technology. Gay-Straight Alliance • Lincoln Parkin works to decrease homophobia at school, in community. Lincoln Parkin wants to live in a world where there is no discrimination, no bullying and people are accepted for who they are. Rather than just dream the 18-year-old is working to create a corner in his own world where acceptance is the norm. As president of Weber High School’s Gay-Straight Alliance club, Parkin works to promote fair treatment for all students, no matter their sexual orientation, race or religion. He is also an active member of the Ogden OUTreach Center, a program that focuses on creating a safe and welcoming community for the lesbian, gay, bisexual and youth and their allies. After learning about the “Pink Dot” campaign through the OUTreach Center, Lincoln worked to encourage Utahns to speak up for their lesbian, gay, bisexual and transgender friends and family members as part of the “Pink Dot” effort. “I felt there is a need for a place for kids to go and be accepted. I think everyone needs to be accepted, not necessarily for what they do, but for who they are as individuals. Lots of youth don’t feel accepted in their family or at their school. I advocate helping people. I know how it feels to be different and to feel like I have to act differently depending on who I’m with” Parkin said. The American Civil Liberties Union of Utah selected three high school seniors in Utah, including Parkin, to receive the organization’s 2012 Youth Activist Scholarship. The recipients received a $1,000 scholarship in recognition of their commitment to civil liberties through activism. Parkin is reaching out to the community. “The most important thing Lincoln has done is to be honest and open about who he is. He spoke movingly at our last community forum, saying that he used to be homophobic, but now has learned to accept himself and others. Honesty like that changes not only the community, but the world,” said Reverend Marian Edmonds, the pastor at City of Hope in Salt Lake City. Parkin has learned to stand up for himself and others. Edmonds said she was most proud of Parkin when he accepted his Rotary Award. After having a gay friend commit suicide, Parkin increased his efforts to take a stand against bullying and suicide. A self-proclaimed “music activist,” Parkin uses his passion for singing to work toward the goal of equality for LGBT people. Parkin plans to continue his dedication to music and activism at Westminster College. Julie Van Orden, a teacher and Gay Straight Alliance adviser at Weber High School, describes Lincoln as friendly and outgoing but says his greatest asset is his hard-earned self-acceptance.